Have you ever picked up a dollar store parachute man that was a total failure? No matter how hard your kid tries, it just refuses to open up…and instead plummets to the ground in a tangle of pitiful plastic and string. I’ve got the answer for you: coffee filter parachute guys! They’re simple to make and a joy to watch as they glide to Earth. When I was a kid, I had the best parachute man ever: a Fisher-Price Adventure People parachute man, circa 1976. He was a full-fledged action figure with a nylon chute, plastic harness and Evil Kanevil inspired jumpsuit with bell bottom pants. You pretty much needed a sling shot to get him up high enough, but his red, white and blue chute ALWAYS opened. Naturally, I was pretty disappointed when I tried to find modern parachute dudes for my boys. All I can find are cheap hunks of flimsy plastic, with chutes your have to string up yourself. Good luck with that! So here’s my answer to the cheap hunk of crap parachute man: the DIY Coffee Filter Parachute Guy! I know you’re pressed for time, but I need to let you know I’ve included a few Amazon shopping links. If you happen to click these and make a purchase, I’ll get a tiny commission. Thanks for supporting your local blogger! He (or she) is made from two pipe cleaners (er, fuzzy sticks) and a coffee filter. Boom. Take a second pipe cleaner and poke one end through the edge of a coffee filter. Fold over once to secure. Take the free end and run through the “hands” of the stick figure (his arms are loops). Connect the free end to the coffee filter and bend up. Ta da! 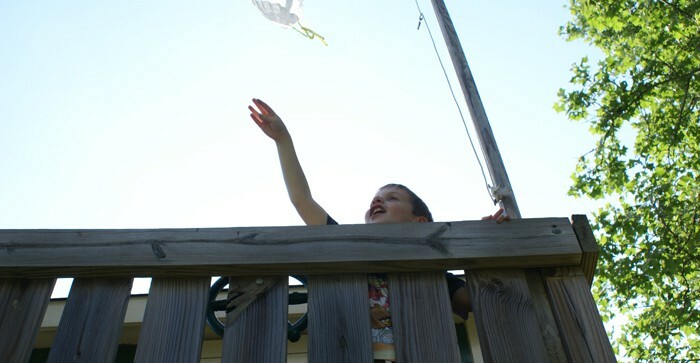 A coffee filter parachute guy! If you want to get fancy, you could decorate the filter with markers, but plain white works well too. Take the parachute guy someplace high, like a playhouse, second floor deck or balcony. You just have to release him and he’ll float down to the ground gently! Remember to leave the parachute open–unlike fabric or plastic chutes, you don’t want to ball this guy up and toss into the air. 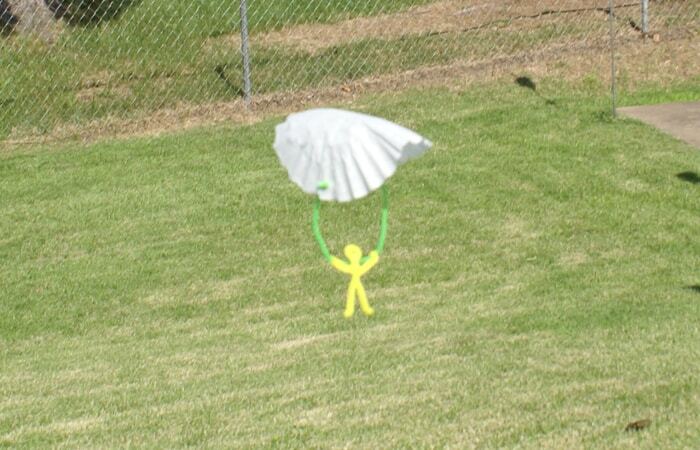 We tried out our parachute guy in the backyard and he floated gently to the ground–every time!